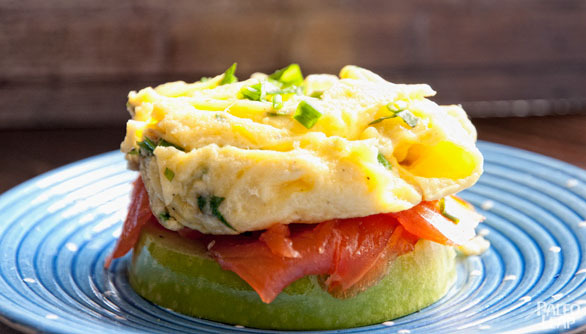 Some Paleo recipes replace a bun with a grain-free bread made out of almond or coconut flour, but this easy “sandwich” forgoes bread altogether in favor of a crisp slice of Granny Smith apple that brings out the contrasting flavors of salty smoked salmon and fluffy eggs. This recipe is simple to prepare but delivers an amazing taste that’s perfect for breakfast or a light lunch. For a fancier occasion, it would also make a creative main course for a garden party, served with some lemonade and maybe a raspberry spinach salad. It’s best to get an organic apple for this sandwich if you can, since apples are right at the top of the “dirty dozen” list of most pesticide-laden produce. It’s a little more expensive, but it’s doesn’t cost nearly as much as almond flour bread, and it’s much better for you (nut flours are very high in calories and PUFA). And as a bonus, the apple “bread” is much easier for the chef. Just make sure to core it before slicing, so you don’t end up with an unpleasant seedy crunch mid-bite! This recipe is already anything but bland, so it’s best to be moderate with the seasonings. Be careful adding salt to the eggs, since smoked salmon is already salty. Tarragon also has a very strong flavor and can easily overpower the other elements of the recipe, so err on the side of caution if you’re not used to using it. Just season enough to bring out the other flavors, and then sit back and enjoy this deliciously healthy take on the typical egg sandwich. 1 or 2 big granny smith apples, cored and cut in 4 thick slices. Break the eggs into a medium bowl and beat until broken. Season to taste with sea salt and black pepper. Over a medium-low heat, preheat your cooking fat in a 10-inch frying pan. Make sure the pan is evenly coated with the fat, and pour in the eggs. Sprinkle with 1 tablespoon of the chives and the tarragon, and let sit for about 1 to 2 minutes. Using a rubber spatula, push the eggs from the edges to the center and let sit. Repeat every 30 seconds, until the eggs are cooked (approximately 5 minutes). Remove the eggs from the heat and divide into four equal portions. 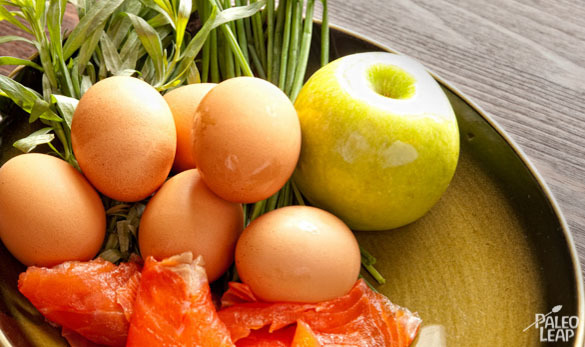 Take the four slices of apple, top each slice with smoked salmon and then with a quarter of the eggs.